Sort tapes and keep them organized! 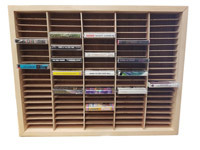 The individual slots hold 100 tapes in all. You'll have an attractive, easy-to-browse display. Solid pine rack is designed to last a lifetime!